Wow. Fox News just finished the renovations to their newsroom. The most notable addition to the “news deck” is all of their new BATs—big area touchscreens—that you can see littering the background. 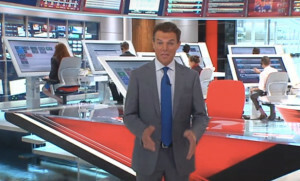 These 55” touchscreen monitors are going to help Fox News anchors report the news better. No, I’m not joking. Seriously. As you know, Fox News has always walked the line between reporting real news and simply broadcasting entertainment. Leaving no room for error, Fox has made a clear tactical move to prove that beyond a shadow of a doubt, they’re all about news. These BATs will be “checking facts” in the background while the news anchor reports the latest finds! That’s how “cutting edge news” is done folks. You know, because size matters too. It’s not just about the tech, it’s the size of it. The bigger the monitors, the more reputable the news is. Right? If the BATs don’t make a strong enough case, Fox also has a 38-foot long video wall to prove its point. Why just sit down and report the news when you can get up from the desk and get some exercise, Nintendo Wii style! I honestly had to do some checking on this one after hearing about it, because I did think it was a joke. Fox News is known for that! Remember the satellite interview between Nancy Grace and her correspondent, who were both sitting right beside each other? If you don’t, check out the video from Jon Stewart who pointed it out!